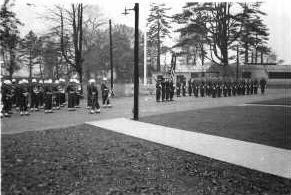 These pictures are from Roy Reeves, a young soldier stationed at Bushy Park when it was first opened in 1953. Street in front of headquarters' bldg as shown in picture #1. 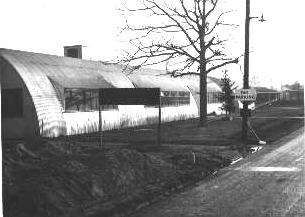 The present two story brick bldg now occupies the open space behind the troops and flag pole - The quonset huts upper right are our "mess hall" and "NCO" club. This area is across the street from HQ Bldg in Pic #1, and to the left read of the assembled troops. 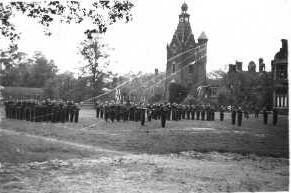 (Honor Guard for the opening of Bushy Hall for USA 32nd Brigade HQ. The huge building in rear, we called "The Old Castle" was used as HQ for U.S. 9th Air Force Fighter Sq WWII. We lived and ate in "castle" while getting our camp ready. 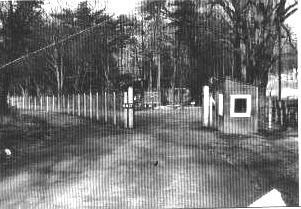 Front gate Bushy Hall in 1954. You can see the 32 AAA Brigade Headquarters sign straight ahead. The Bushy Hall golf course is on the left.